Oregon Bounty, which promotes travel to Oregon and specifically its local food and beverages, is sponsoring a very cool contest. 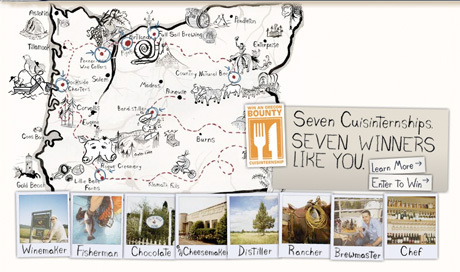 They’re offering seven “cuisinternships” to local artisan businesses. You can be an intern chef, cheesemaker/choclatier, distiller, fisherman, rancher, winemaker, or — the coolest of the seven — craft brewer. Winners get an all-expenses paid trip to Oregon which includes round-trip airfare, six-nights lodging, and $1,000 cash spending money. You’ll then intern for five days. You can enter online with a two-minute video and/or your 140-character essay on why you deserve to win an Oregon Bounty Cuisinternship. That’s basically a twitter post; a tweet. The deadline to enter is coming up; it’s Friday September 18. There’s also an FAQ if you have any questions about the contest. The brewery Cuisinternship is with Jamie Emmerson at Full Sail Brewing in Hood River, Oregon. I’ve known Jamie for a long time now, and he and the staff of Full Sail couldn’t be nicer people. Plus, Hood River is an absolutely gorgeous part of the world. Here’s a sample of what you’ll be doing if you win: Tour the Great Western Malting and Hop Farm, learn about mashing and the mash tun, learn about sparging and the lauter tun, understand the spice of the beer and the contributions of the hops and kettle, pitch the yeast (the magic ingredient), look under the microscope in the lab, partake in bottling at 500 beers per minute, fill kegs, and — most importantly — taste the rewards of your hard work. Whew, that doesn’t sound too bad, does it? Along the shores of the mighty Columbia River Gorge, get a week-long lesson from some of the country’s craft brewing pioneers. From the hop farm to the mash tun to the microscope, you’ll feel, smell and taste beer from beginning to end. If you can tear yourself away from the tasting table, explore the charming town of Hood River, unofficial U.S. capitol of windsurfing, beer drinking and hanging out.